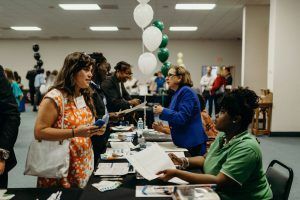 The Jobs Partnership is dedicated to providing the education and resources struggling Central Florida residents need to develop their skills and find a better job. Here are a few ways we can help you set your life and career in motion. Through our LifeWorks Program, individuals experience a no-cost, 12-week training program that equips students with the skills needed to acquire and maintain a decent job. The program also helps them explore different career paths to ensure they are able to find and keep the right job. Moreover, the LifeWorks program offers students the opportunity to change their outlook while networking with educational partners and potential employers. The Jobs Partnership works to help LifeWorks graduates find scholarships and other learning opportunities through one of our partner institutions, such as Valencia College and Orange Technical College. Our community partnerships help us provide supplemental financial assistance to eligible applicants wishing to pursue an education or short-term training course that will improve their income-earning potential. If you are looking to further your training, we can guide you in continued, short-term education and development needs to help you accomplish your academic goals. Our partner institutions offer a variety of career training programs that allow adults the increased opportunity to network, earn certificates, enhance their current abilities, learn new concepts, switch careers, and enhance their potential for job advancements. Many employers are looking for employees who not only have the technical competencies to do the job, but the soft skills to communicate and engage coworkers and customers. The knowledge you acquire at The Jobs Partnership gives you the holistic foundation you need to create a successful job path. With the skills and training gained, you can polish your resume and begin your job search at our private career fair Apply for our LifeWorks program today.